DESCRIPTION: This new addition to the family of Workshop and Enthusiast Manuals provides an excellent review of two important WWII German utility vehicles that saw widespread use in all theatres that German forces were deployed to. The great strength of the publisher continues to lie it the extensive range of vehicle owner’s manuals and this book is therefore rather less of a departure than some of the manuals produced in the broadly military genre. It is still a little mystery why the publisher introduced the ‘Enthusiasts’ Manual’ description when there is no significant difference from ‘Workshop Manuals’. That aside, this is another fine work that employs the well-tried and very popular manuals format developed by the publisher. The crisp images, photographs and drawings, add greatly to the information presentation. Once again, this is a book that will appeal strongly to military enthusiasts, but it covers two vehicles that could be acquired and maintained by a range of vehicle enthusiasts also. 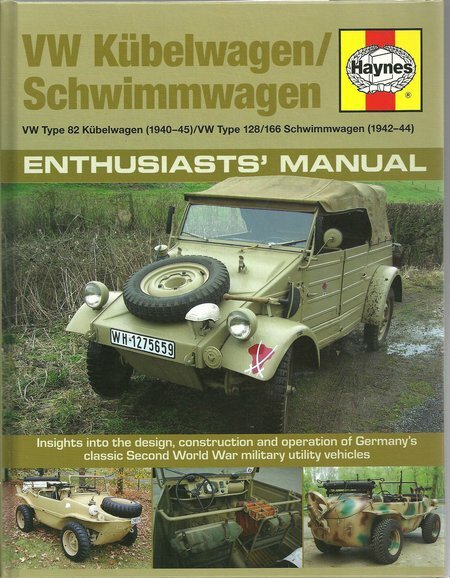 As with other manuals in the military series, this book provides a solid historical background, the views of drivers and engineers, detail about surviving examples, and a very clear presentation of the basic design and features of the vehicle, together with the engine and transmission system. The VW was both a brilliant technical concept of its time and a con trick that saw German workers contributing money to a fund that was claimed to be able to provide them with their own VW car. The VW combined an advanced concept for private vehicles with a remarkably simple and dependable structure and components. The bodywork was also advanced for its time with a streamlined shape that still looks current more than 70 years later. Turning this vehicle into a military utility vehicle was relatively simple and straight forward. The resulting Kubelwagen was to be produced in large numbers and used across Europe and North Africa. The amphibious Schwimmwagen was developed from the Kubelwagen and was an ideal light reconnaissance vehicle for use on the Eastern Front where there were many rivers to cross and metalled roads were rare. Both vehicles were essays in value engineering, where anything that was not essential was stripped out to make a light low cost vehicle that would be easy to build in large numbers.